Sugar, butter and flour are the ingredients that go into the 27 varieties of pies that Jenna bakes daily at Joe’s Pie Diner where she also works as a waitress. And heart, soul and melody are on the menu of this beautifully crafted, heartfelt new Broadway musical that is – stunningly – the first-ever where the four top-line creative positions of writers, director and choreographer, are filled by women. 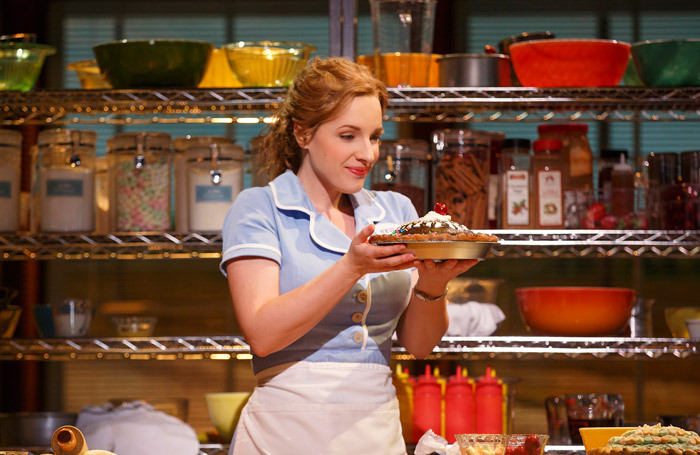 Waitress is a show that is not only told from a woman’s perspective but also offers a rich portrait of female empowerment, as the downtrodden newly pregnant Jenna throws off the shackles of her abusive marriage, has a brief affair with her married gynaecologist and eventually – thanks to the generosity of a man – finds herself in charge. It is propelled by a performance of open-hearted generosity and raw, tangible emotion by Jessie Mueller, who originated the role of Carole King in the still-running Beautiful, as Jenna. She gives a poignant but unsentimental account of a woman who finds her own escape. Jessie Nelson’s book, based on the 2007 film of the same name, is also strong on the power of female friendship, as Jenna’s two work colleagues – irresistibly played by the brassy Keala Settle and the more delicate Kimiko Glenn – support her while seeking happiness themselves. Best of all, singer-songwriter Sara Bareilles, making her theatrical debut, supplies a set of songs that have her own distinctive twang of country-inflected pop yet also pulse with feeling. They contain a bracing edge that commands rapt, enraptured attention, while director Diane Paulus keeps things emotionally engaging, witty and lingeringly, achingly human.